The bear call calendar spread is a combination of the option credit spread and calendar spread strategies. It is simply a credit spread but with an expiration date variation. You will have one leg of the position expiring in the front (nearest) month, usually between 30-45 days and the other leg in a later (back) month. The front month position will be short (sold) and the later month, long (bought). Both legs will contain an equal number of options positions. Credit Received = 47 cents per position We take out 10 positions for a total $470 credit. We then analyze the above position which produces the following risk graph. Our breakeven point on the SPY is $122.38 which means the SPY can rise to that level before we start losing money. Above that, our loss sets in and falls away to a maximum loss of around $2,500 once the SPY breaks above $160. 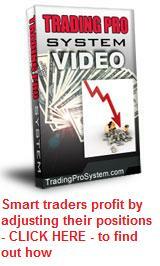 Our maximum profit of $2,500 is achieved if the SPY closes at $117 on October expiration date. So this is one of those positions where the maximum profit is about the same as the maximum loss. If the SPY falls lower than 117 before expiration, our profit gradually tapers off but has a guaranteed minimum of our $470 credit received when we initiated the transaction. So this is definitely a bearish option spread trading strategy, but when price action of the underlying SPY goes against us to the upside, it receives some protection from our longer dated call options. Below is a risk graph using exactly the same number of option contracts, only this time, all with October (i.e. same month) expiration dates. If we had only used October SPY options for both legs. Our upside breakeven would've been reduced to $118.59 and above that, falling away to a maximum loss of $1,400. On the downside however, our maximum profit would be $1,600 if the SPY closes below $117 at expiration date. This $1,600 would be the intial credit premium we received which we note is greater than for the bear call calendar spread at $1.60 per contract. Since our choice of option trading strategies is really just a matter of risk vs reward over a range of strike prices up to a given expiration date, you would be more inclined to enter a bear call calendar spread if you believe the price action of the underlying will remain pretty much unchanged up to the last week before expiration. You will receive the maximum profit potential this way. This strategy is therefore most suitable to a stock that whose price action has low historical volatility. Consulting weekly and monthly charts will help you here.